The term “line item” refers to any service or product added to an invoice, along with any quantities, rates, and prices that pertain to them. On your ZipBooks account, these are called Items (for products you sell), and Tasks (for services you perform). Sometimes, you’ll have certain line items that you use frequently when you create invoices. To cut down on prep time, save your line items for future use. Let’s say you sell auto parts online. Each of the parts you sell has a long product number and a detailed description. Every time you bill your customers, you have to look up product numbers for each item, and manually enter the description and pricing on your invoices. Each of these auto parts (and its corresponding details) represents a line item on your invoices. 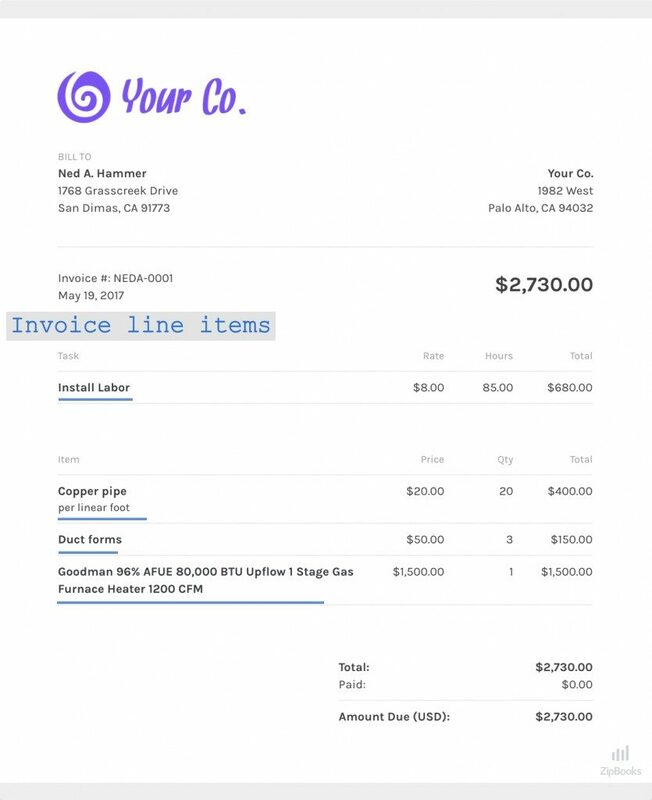 Using ZipBooks, you can save line items from within an invoice or from your Items list. Then, the next time you create an invoice, select the Item or Task you want from the dropdown list. Just one click, and all the details will automatically appear!